The Museum is open Memorial Day through Labor Day. Hours are Sunday through Saturday, 11:30 a.m. to 4:30 p.m. Admission is free but donations are appreciated. A State Park sticker is not required. Driving north: As you drive north on Highway 41 take the Highway 22 exit. Turn left around the round-about, under the highway, then left around the second round-about to Copper Culture Way. There are signs to help. continue to the t-intersection and turn left. Follow the road around to the park. Driving south: As you drive south on Highway 41 take the Highway 22 exit. Go around the round-about to exit on the opposite side at Copper Culture Way. There are signs to help. Continue to the t-intersection and turn left. Follow the road around to the park. The Old Copper Culture people are early inhabitants of Wisconsin in an area that is the ancestral home of the Menominees. The name “Old Copper Culture” is derived from the fact that these people made a variety of bracelets, spear points, fishing hooks, knives, and other ornaments and tools out of copper. They worked the copper by alternating hot and cold hammering, called annealing. They are among the earliest known metalsmiths in the world, and the first in North America. Copper tooling in various fashion has been known around the world for 10,000 years, but this is the first instance of its use in this country. The copper was mined in the Lake Superior region during the warmer months and transported south to a tooling or village site. One copper tooling site has recently been uncovered in Cahokia. These people lived in the Middle Archaic period. Carbon 14 tests conducted at the University of Chicago in 1953 placed these people here as far back as 7,510 years ago, between 5500 and 5600 BC which predates the ancient Egyptian pyramids. During this period, sustenance was gained by hunting, fishing, and collecting wild foods. Pottery making, mound building and agriculture of the later Woodland period were unknown to the copper industry people in Oconto. They buried their dead here using the natural elevation of the land during a high water period. Potential trade items found include a portion of a lightning shell (a type of whelk found on the Atlantic and Gulf Coasts), and Mississippi River shell. Copper, as well as bone (including a swan bone whistle) and other artifacts were also found in the graves. This is the oldest known burial site in Wisconsin and one of the oldest in eastern North America. Copper artifacts found at distant locations indicate the possibility that Archaic people, too, had a trade network as far-reaching as the Gulf of Mexico and the Atlantic Ocean. Discovered by 13-year-old Donald Baldwin in 1952, the site was excavated by archeologists from the Milwaukee Public Museum and the Wisconsin Historical Society, aided by the Oconto County Historical Society’s founder George E. (Jimmy) Hall and Senator Reuben LaFave. This Archaic burial cemetery is one of only four of its kind known today. Twenty-two burial pits were uncovered, although as many as two hundred burials may have occurred here. The majority are believed to have been destroyed by gravel quarrying in the 1920s, but, had it not been for quarrying, the site might not have been discovered at all. Charles and Emma Werrebroeck and their infant daughter, Anna, immigrated to the United States from Belgium in 1911. Charles, a mason by trade, built the brick Werrebroeck home in 1924. Molds were used to form basement blocks over which he built a traditional brick Belgian farm house. His first house here was wood, which was destroyed by fire. His property originally had out-buildings, several barns, and a wood shed. A porch attached to the front of the house helped insulate against the harsh Wisconsin winters. The home did not have plumbing or central heating; the Werrebroeck’s heat was provided by two stoves—the cooking stove in the kitchen and a pot-bellied stove in the house’s other main room. Water was supplied year round by an outdoor pump located at the south side of the house. 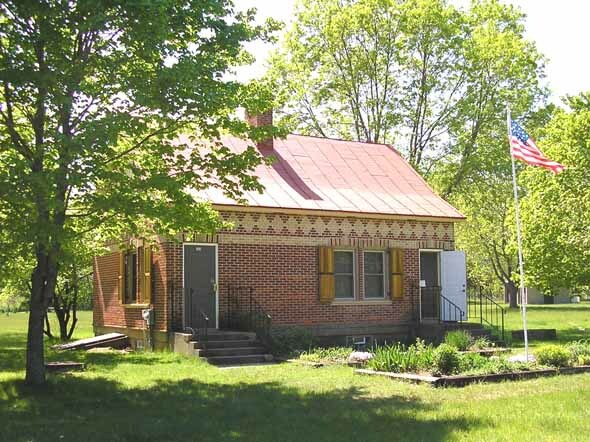 This house now serves as the CopperCultureStateParkMuseum, where exhibits and information are continually updated. The Werrebroeck House and museum present photos and artifacts of the 1952 archeological dig. A short video shows the archeologists at work on the site. A mock excavation pit allows children to experience a dig. More recent artifacts of Native American culture are also on display. A tour guide is available to give an in-depth tour if desired. A foot trail leads from the parking area to a stone monument at location of burial ground.